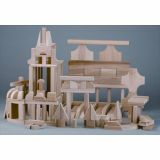 Toddlers stack, sort and build and as the children get older they will use it as fence for animals, like a tunnel for vehicles, as house for dwarfs and dollhouse dolls, build amazing sculptures. This toy will always be integrated in playing with a lot of fantasy. Earth Materials: lime wood, non-toxic water-based colour stain. Medium Earth Size: length 16cm. Includes 5 PCS. Use soapy water with a damp cloth for cleaning. 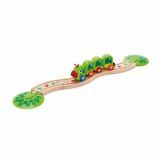 Suitable for play both on and off the tracks, this caterpillar train brings colour, movement and lessons about the natural world to playtime. 7 pieces. Ages 18 months and up. Solid hardwood playblocks. Contains 130 pieces. Truck Toys : Ages 18 months and up. 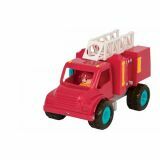 Fire Engine: Cab tilts to access removable driver. The ladder pivots to upright position. One fireman can sit on top of the ladder while the second fireman rides on the back of the truck. Soft rubbery wheels. Includes 2 firefighters. Dump Truck : Working, movable parts let little hands move payload after payload. Soft, rubbery wheels. Driver is removable by tilting the cab. Rear gate has a lever that opens the rear gate and the dumpster tilts back to empty load. 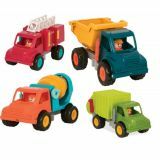 Cement Truck : Working, movable parts put you in charge of keeping the cement mixer turning. Soft, rubbery wheels. The cab tilts to access removable driver. Turn the crank to make mixer turn. Garbage Truck : Garbage truck features a tilting cab to access a removable driver. A lever opens the rear door for garbage bin access and the bin tilts to empty 2 trash cans. Features soft plastic wheels. 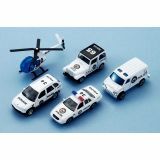 Free wheeling die cast vehicles, each 3" long. Ages 3 and up. 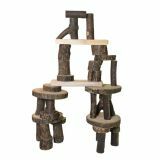 Adventure awaits on this knee-high table from the forest floor to the jungle canopy tree-tops! 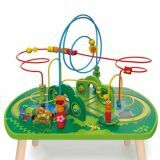 A jungle train winds its way through the underbrush as monkeys and parrots leap and flutter through the dense bead maze forest above. Ages 18 months and up. 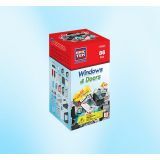 The Windows and Doors kit contains 86 pieces, which also includes 2 figurines. Ages 4+. Realistically detailed plastic animal playsets encourage learning about the natural world. 11 pc. 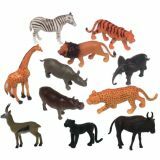 wild animal set includes elephant, giraffe, zebra, lion, hippo, tiger, jaguar, rhino, cape buffalo, antelope and cheetah. Giraffe is approx. 7", other animals are 5" - 6" (measured diagonally). Ages 18 months and up. 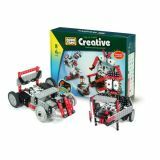 A complete system that covers robot making, robot controlled programming to robot manipulation. Builds 9 models. Includes detailed assembly guide. Ages 8 and up. 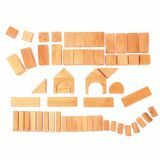 These 60 geometrical blocks come in a 3 different thicknesses 1 cm, 2 cm and 4 cm thickness. Packaged in natural coloured net bag. Made using European-sourced FSC-certified wood. Use soapy water with a damp cloth for cleaning. Dry immediately. Do not submerge in water. Do not use disinfectant or hot water. 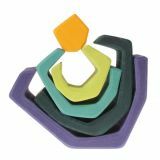 Freeform pieces come in precision-cut 2 cm increments (2,4,6,8 and 10cm) with large 2cm disks and bridges to support successful building and early math and metric system learning. Diameter of blocks varies. A typical set includes "Y" or forked pieces. Safe, lab tested. Boxed.